One of the most fun projects Gaga has just launched is the re-branding of Ocean Downs Casino. 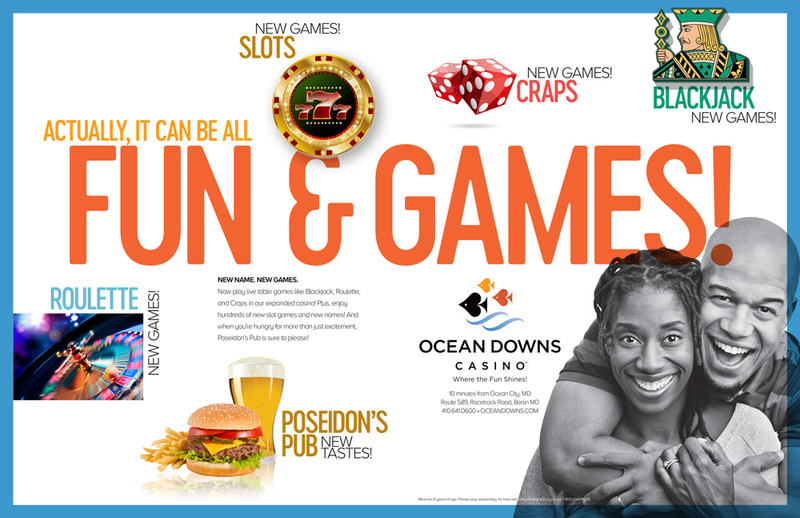 We've been very fortunate to be the advertising agency for Ocean Downs since they opened as a casino 7 years ago; but with their purchase by Churchill Downs, and the fact they now have Table Games, we had the opportunity to change their name from Casino Ocean Downs to Ocean Downs Casino and to give them a new logo and direction for their messaging. We thought an icon that visually said both “Ocean” and “Casino” (especially Table Games) would be perfect! And a spade, turned to it’s side, looked just like a fish. So voila! The “Spade Fish” logo was born, as was a fun, clean and whimsical look for the advertising! It’s branding assignment like these that keep us swimming!